NutraBio EAA Energy: Full-Spectrum Amino Energy Done Right! Contains: Tree Nuts (Coconut). PHENYLKETONURICS: Contains Phenylalanine. Flavoring (Citric Acid 1.2g, Natural & Artificial Flavors 525mg, Malic Acid 500mg, Sucralose 150mg, Salt 120mg, Acesulfame Potassium 30mg), Spirulina (color) 25mg. Mix 1 scoop with 10-16 ounces of water. Consume before, during or after exercise or sip throughout the day as a healthy energy drink substitute. Try adding 3 scoops in a gallon jug to bring with you wherever you go. KEEP OUT OF REACH OF CHILDREN. Contains 150 mg of caffeine per serving, about as much caffeine as a cup of coffee. Do not use more than the recommended amount and avoid using with other caffeinated products or if you are sensitive to caffeine because too much caffeine may cause nervousness, irritability, sleeplessness and occasionally, rapid heartbeat. Consult your physician prior to using this product if you are pregnant, nursing, under 18 years of age, taking medication or have a medical condition. Immediately discontinue use and contact your physician if any adverse reactions occur. Discontinue use two weeks before surgery. Flavoring (Citric Acid 1.8g, Natural & Artificial Flavors 805mg, Malic Acid 800mg, Sucralose 150mg, Salt 120mg, Acesulfame Potassium 30mg), Color (Beet Powder 60mg, Beta Carotene 40mg). Flavoring (Citric Acid 1.5g, Natural & Artificial Flavors 925mg, Malic Acid 700mg, Sucralose 150mg, Salt 120mg, Acesulfame Potassium 30mg), Beet Powder (color) 50mg. Launched at the 2018 Mr. Olympia in conjunction with Bodybuilding.com, EAA Energy puts a NutraBio spin on energy aminos, and by that we mean this label is decked out! Read all the details on our NutraBio EAA Energy ingredients post on the PricePlow blog! 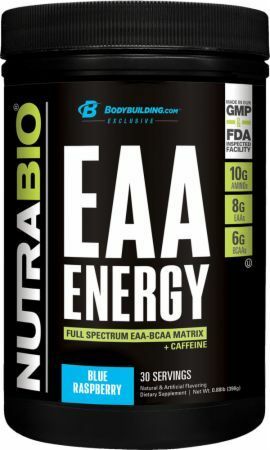 With a full spectrum of muscle-building essential amino acids, with caffeine (see EAA Pure if you want it caffeine-free), and the NutraBio standard fully disclosed label down to the flavoring and sweetening... this is energy aminos done right!